Avoid confusion and unneccessary calls by providing customers with these clever calendar reminders. The removable sticker can be applied to a wall calendar to assure the customer won't forget the appointment. Great for medical practices, beauticians, auto maintenance shops, attorneys - any business with recurring customer appointments. Printed on white self adhesive card stock. 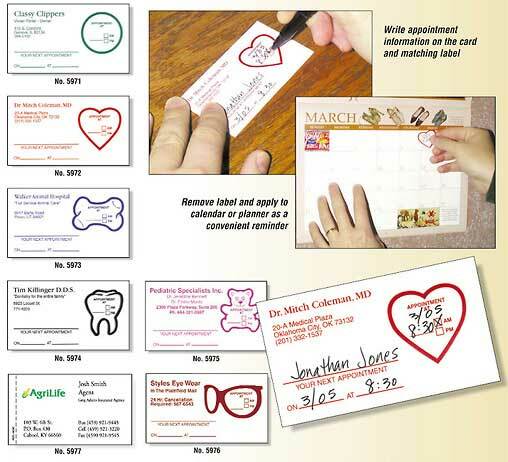 Kiss cut peel off sticker can be applied to a calendar or planner as a convenient reminder. Choose up to six standard colors or full color at no extra charge! NEW for 2019 - ask about printing on the back for even more exposure to your customers! Call or email for pricing on larger quantities. Normal production time is 5 working days. Design Your Own Appointment Card - Contact us for templates if you would like to create your own design or have our designers create a look for you! 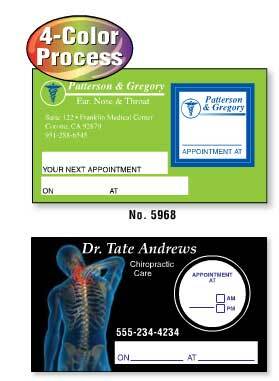 To request additonal information on Appointment Cards with Removable Stickers click here.